The John Verity Band will be appearing at this Sunday’s Hope Tavern Blues Session. John has had a varied and amazing career since the 1970s, supporting rock luminaries such as Jimi Hendrix, Janis Joplin and The Who, as well as recording with Ringo Starr, Greg Lake and Phoenix, to name but a few. 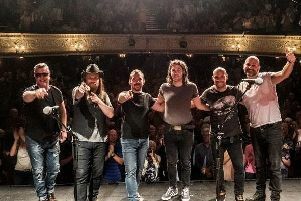 Recording and touring constantly, with his distinctive soulful blues edge, 2016 was John’s busiest in recent years and especially so with live appearances with his band; a fluid line-up, but always with musicians of the highest professionalism and musicality. Even though John is also an established producer for numerous bands and musicians, a priority has always been live performances as evidenced by an extensive touring schedule coming up this year. He also found time in 2016 to record and produce the latest album My Religion, which was played on numerous radio station, and reached number 15 of the most played albums on the IBBA (Blues) charts earlier in the year. For many of John’s recent performances he has been accompanied by Jamie Mallender on bass and their new innovative drummer, Liam James Gray, who has been received with enthusiastic acclaim everywhere they play. The show at the Holton le Moor venue starts at 4pm and the door charge is £8.